By Blue Cube	on Friday, 21st Sep 2018	in News, User Guides. You want a pool but you’re new to pools in general and would like to know the differences between a wooden pool and a fibreglass pool. They each have their pros and cons. Below we will discuss the two types and why they work and don’t work. Fibreglass pools are quick and easy to install, they offer a great solution for those who want quick installation for instant use. The basic construction methods of a fibreglass pool include, digging the hole, placing the one-piece fibreglass pool in the hole and fitting the plumbing (there are numerous in-between steps and it won’t be done in a day, but it certainly wouldn’t take weeks). 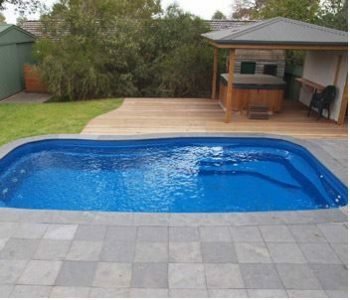 What people enjoy about fibreglass one-piece pools is the fact that most of the work is done before the pool arrives on site, it will factory tested for leaks and strength, so you are guaranteed a strong durable pool. However please note that not all one-piece pools are fibreglass and we will discuss why later. Fibreglass pools are often chosen due to their appealing surface coating which offers a smooth and stunning finish without the need for tiles or a liner. This surface is often easy to look after and keep clean which makes maintenance simpler. Some believe that a fibreglass pool feels warmer due to the materials used and some believe they heat up faster than other pools. Now for the bad, no pool construction method is perfect, some are slower, some are more expensive, and others can have potential on going issues. Before choosing any pool build we advise you do your research and speak to a reputable pool builder. In the U.K SPATA is the regulating body of swimming pool builders. As we mentioned fibreglass pools comes direct from the factory although this means thorough tests you cannot guarantee issues later, due to the manufacturing process fibreglass pools are notoriously difficult to fix properly once something goes wrong. For example, if you do get a crack or a leak it is often very hard to find the exact colour match for your patch which can lead to a tired looking pool. Fibreglass pools come in a set shapes and therefore require back filling for support and integrity, they are usually back filled using sand. The issue with this is when heavy rainfall occurs the sand may slowly get washed away which compromises the integrity of the wall structure and can lead to cracks etc. Another problem is when sand gets saturated with water it can cause bulges to occur in the pool walls. If the pool pipes are resting on sand for support over time this sand compresses or moves which in turn causes the pipes to move and leak, this would require the surrounding area to be dug out and cause a huge and costly upheaval. One prominent issue with all things made from fibreglass are the hairline cracks which appear over time due to use, they often don’t cause any structural issues or leaks, but they don’t look beautiful and your beautiful smooth surface we mentioned before will be ruined. With this in mind, it is always best to do your research and ensure you are aware of all warranty cover offered on every part of your pool. Wooden pools are also quick and easy to install, although they require onsite construction this process is relatively quick and can even be done by avid DIY’ers who fancy that extra challenge, this means that it can be done at your own pace and therefore budget. They come in all shapes and sizes and offer a solution for all budgets, many come as packages with heating, filtration and covers so there are no hidden extra costs. The wood finish offers a subtler finish if you do not want your pool to dominate your garden. Unlike other above ground pools, they are hard wearing and extremely durable, providing you with years of swimming fun and relaxation. Unlike other in-ground pools the overall cost is far less, most wooden pools can be placed above ground, semi submerged or fully submerged depending on what style you want. 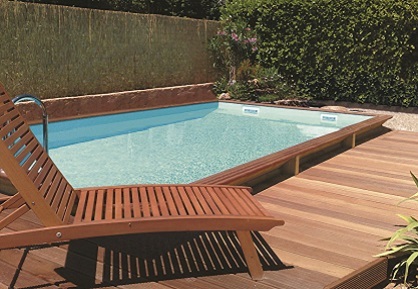 Wooden pools offer more flexibility in use by combining a swimjet system to extend your swimming space, so if size is an issue simply opt for an exercise pool kit and you can swim for as long as you like without needing to turn and do laps. Price wise, wooden pools are considered the cheapest permanent pool structure which makes them an extremely popular choice. As previously mentioned no pool construction is perfect, we will now look at the problems with wooden pools. Although the liner if well looked after will last up to 10 years, sometimes accidents happen, and they get torn, some tears are quite small and are easily fixed with a vinyl patch however larger and multiple tears may require a full liner replacement, these are relatively easy to do but the outlay for a new liner can be quite costly. One way to prevent this happening would be to ensure all sharp objects are kept out of the pool. Cheaper wooden pools may not be made of the best materials and can lead to issues with the wood rotting etc so make sure the wood is properly treated when purchasing. If the pool is an above ground one and large it may be difficult to keep warm in colder months as in-ground pools have extra insulation from the ground nut putting it in the ground would help with this. 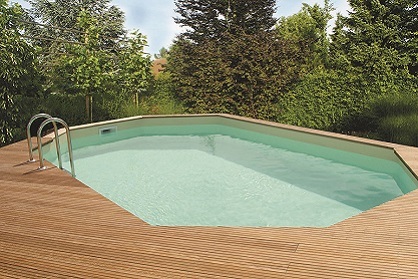 Click here for more information on wooden pools.